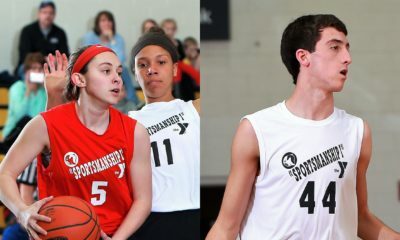 Missing one game (Newport vs. DuBois). It will be added as soon as information is received. SMETHPORT, Pa. – Behind four touchdown passes from Sawyer Drummond, Otto-Eldred captured its second straight AML North crown with a 32-6 win at Smethport. Drummond tossed scoring passes to Cameron Magee (12 yards), Nick York (6 yards), Dylan Close (87 yards) and Gage Babcock (34 yards) in the victory going 17 of 29 for 231 yards with an interception. Close had 11 catches for 155 yards and the score with Magee catching three for 22 yards. Babcock had the one scoring catch and added 94 yards rushing on 10 carries while York had the one catch and also intercepted a pass on defense. Nate Hollowell ran 21 times for 105 yards and a touchdown for Smethport while Blake Kinner added 10 carries for 58 yards. Otto-Eldred is 6-3 overall and 5-0 in the AML North and plays at Kane in the AML Title game Friday night. The six wins are the most for the Terrors since they went 6-3 in 2003. Smethport is 3-6 on the year and 3-2 in the AML North. The Hubbers could still qualify for the District 9 Class 1A playoffs, but with a 3-6 record, it is not known if they would go. If they don’t, their season is over. 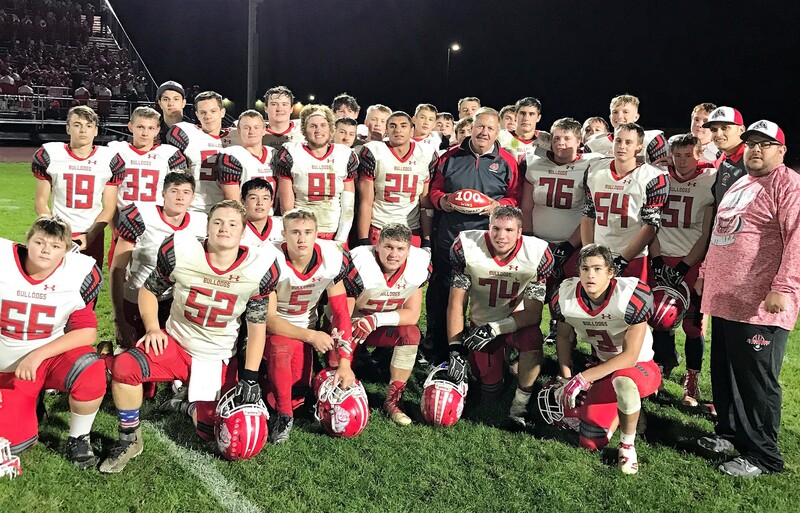 PUNXSUTAWNEY, Pa. – Keaton Kahle ran for two touchdowns and Clint Thurston broke the school’s single-season touchdown record with a 1-yard run and kicked a 27-yard field goal as Redbank Valley gave head coach Ed Wasilowski his 100th career win with a 33-7 victory at Punxsutawney. Kahle ran seven times for 92 yards, including a beautiful 62-yard scoring run at the start of the third quarter that put the Bulldogs (5-3) up 17-7, while Thurston was the workhorse rushing 28 times for 115 yards with a 1-yard touchdown run in the fourth quarter for the final score of the game. Thurston’s score, which was set up by a Chase Wiles interception of a Dylan Ishman pass at the Punxsutawney 15-yard line that he returned to the 1-yard line, was the 24th of the season for the senior running back breaking Mark Strother’s school record of 23, which Thurston tied last week, set in 2013. Hunter Wiles added a 5-yard scoring run for the Bulldogs, who also scored on a safety, while Kahle was also 8 of 17 passing for 59 yards and an interception. Redbank Valley ran 65 plays to Punxsutawney’s 34 and outgained the Chucks (4-5) 320-129. Ishman was 9 of 13 passing for 76 yards, an interception and a touchdown. Tyler Richardson caught four passes for 33 yards and a score with his 20-yard touchdown giving the Chucks a 7-3 lead in the second quarter. But Kahle scored on a 6-yard run in the final seconds of the half to put Redbank Valley up for good, 10-7, at halftime. After the safety made it 19-7 in the third quarter, Redbank Valley overcame two touchdowns called back by penalty – one by Brock Barrett on the free-kick return and another on a 30-yard run by Thurston – and four penalties for 35 yards (not including the one on the free kick) to put the game away with a 16-play, 53-yard drive that ended with the Wiles’ run and included a 25-yard Kahle to Ethan Hetrick pass when the Bulldogs were facing second-and-a-country-mile from the 30-yard line that saw Hetrick catch a ball intended for Barrett that was broken up but found Hetrick. With the win, Wasilowski, who is in the sixth year of his second stint as the Redbank Valley head coach – he was also a long-time assistant with the Bulldogs, is 100-72. EMPORIUM, Pa.- Adam Streich’s touchdown run with 4:29 to play followed by Derek Beldin’s two-point conversion run gave Cameron County its first win of the season, 30-29, over visiting and winless Sheffield. The touchdown came at the end of a 79-yard drive for the Red Raiders (1-8 overall, 1-4 AML North), who trailed by 15, 29-14, at one point in the first half before scoring the game’s final 16 points including the only eight of the second half. Streich and Beldin played big roles in the season-ending victory with Steich, who ended the season with 1,001 all-purpose yards and 2,102 all-purpose yards in his career, going 10 of 22 passing for 162 yards, two touchdowns and an interception while also rushing seven times for 17 yards and the score and Beldin carrying the ball 25 times for a game-high 106 yards and catching one pass for seven yards. Caden Beldin caught a pair of touchdown passes from Streich and had six catches for 117 yards, while Jared Whiting added a 2-yard scoring run. Cale Albaugh threw four touchdown passes for Sheffield (0-9, 0-5) going 14 of 32 for 280 yards with a pair of interceptions. Albaugh also rushed seven times for 42 yards. Josh Aguidio had four catches for 126 yards and three scores and added 54 yards rushing on 13 carries. Ryan Weaver added three catches for 54 yards and a touchdown, and Kevin Evans had four catches for 57 yards and six carries for 34 yards. Ebon Jackson picked off two passes to help the Cameron County defense. Sheffield finishes the season when it hosts Eisenhower Saturday, Oct. 28. CURWENSVILLE, Pa. – After spotting Curwensville a 14-0 lead early in the second quarter, Bradford turned to senior running back John Eakin, and the big fellow responded with 24 carries for 191 yards and three touchdowns as the visiting Owls beat the Golden Tide, 23-14. A 46-yard touchdown pass from Bryce Timko to Josh Terry and a 40-yard Nick Stewart scoring run lifted the home team to a 14-0 lead 2:55 into the second quarter. But Eakin scored on a 13-yard run with 26 seconds left in the first half to cut the lead in half at the break, and the Owls (7-2 overall, 3-2 AML South) got within five, 14-9, on a late third-quarter safety. Then Eakin scored on runs of 26 and 7 yards in the fourth quarter to turn the tide. Eakin was pretty much the entire offense for the Owls, as he had 191 of their 202 yards on offense. Stewart led Curwensville (7-2, 3-2) rushing 24 times for 122 yards and the score and adding a catch for nine yards with Timko going 9 of 21 for 139 yards, the touchdown and an interception. Terry had four catches for 86 yards and the score. 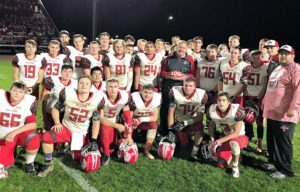 The win helped secure a District 5-6-9 Class 4A playoff spot for the Owls, who are off next week, while Curwensville will host Philipsburg-Osceola. STRATTANVILLE, Pa. – Ayden Wiles and Riley Hummell both broke 100 yards rushing, as Clarion-Limestone claimed the second automatic District 9 Class 1A playoff berth awarded to the KSAC Small School Division with a 64-12 trouncing of visiting Keystone. Wiles ran six times for 153 yards and scored on a seven-yard run to start a 34-point first quarter for the Lions (5-4, 2-1 KSAC Small), while Hummell added 11 carries for 106 yards and two touchdowns and two catches for 20 yards and a score. Brenden Makray, meanwhile, threw three touchdowns and ran for a fourth while becoming the third quarterback in C-L history to eclipse 4,000 career yards. Makray was 7 of 11 passing for 129 yards giving him 4,092 career yards behind only Hayden Johnson (4,401 yards) and Dan Miller (4,250 yards) in school history with at least two games left to play. He ran once for seven yards and the score. Makray’s scoring passes went to Austin Newcomb (44 yards), Kyle Kerle (25 yards) and Hummell (8 yards). Offensive lineman Christian Smith added a 1-yard scoring run in his final regular-season home contest, while Newcomb ran for a 21-yard score as well, C-L’s only second-half score after it led 56-0 at halftime. Newcomb had one catch for 44 yards and five carries for 56 yards. Kerle led the Lions with 68 yards receiving on three grabs. Taylar Altman paced Keystone (3-5, 1-2) rushing for 49 yards and a touchdown (34 yards), while Jaden Blazosky caught a 31-yard scoring pass from Isaak Jones and had two catches for 37 yards. A less than 100 percent Corey Rapp had one carry for nine yards for the Panthers and caught two passes for 12 yards. C-L is at Punxsutawney next week while Keystone hosts Brookville. BROCKWAY, Pa. – Behind a pair of JT Stewart touchdown catches Kane remained unbeaten with a 28-17 win at Brockway. Stewart, who also had an interception on defense, caught six passes for 108 yards and the scores, while Reed Williams, already the Wolves all-time leading passer, surpassed 4,000 yards in his career by going 13 of 18 for 143 yards and the two scores. He has 4,035 career yards and 55 passing touchdowns. Erik DeLong added 16 carries for 156 yards and a touchdown for Kane (9-0, 5-0 AML South), and Jake Alcorn had seven carries for 38 yards and a score. Jon Wood and Tyler Serafini ran for touchdowns for Brockway with Wood rushing 16 times for 116 yards and Serafini 19 times for 78 yards. Peter Downer was 8 of 20 passing for 125 yards but was picked off three times. Dylan LeCates had four catches for 54 yards. The Rovers fell to 6-3 overall and 2-3 in the AML South with the loss. They are off next week before starting the District 9 Class 2A playoffs in two weeks against the same Kane team but this time in Kane. 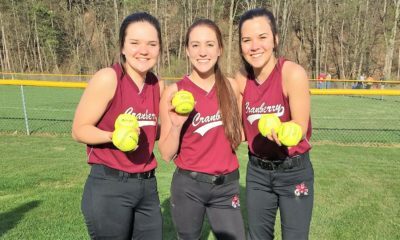 BROOKVILLE, Pa. – It was another big scoring night for Brookville as it hiked its record to 8-1, its best start since 2006, after a 65-13 rout of St. Marys in a KSAC Large School matchup Friday night. The Raiders (8-1 overall, 4-1 KSAC Large) wrapped up their divisional schedule by putting up 42 points in the first half and getting the PIAA’s Mercy Rule running clock going by the 4:18 mark of the third quarter with a 56-13 advantage and then finishing with a school-record 65 points. Raiders quarterback Jack Krug was nearly perfect, completing 10 of 12 passes for a school-record 387 yards despite throwing just one pass in the second half. He already owned the record from his 372-yard game in the season-opener at Warren. Krug threw four TD passes, all in the first half, of 36 and 50 yards to Cabe Park, 63 yards to Bryan Dworek and 60 yards to Nick Keth. Dworek caught four passes for 131 yards, returned two punts for 69 yards, one kick for 20 yards and had two of his three punts go 50 or more yards with his longest traveling 54 yards. Brandon McGranor ran for 88 yards on 15 carries with a game-opening 35-yard TD run and a 2-yard TD run in the third quarter. Shaun Reynolds and Osowaldo Casares scored on runs of 1 and 7 yards. Backup quarterback Tyler Ohls threw a 20-yard TD pass to Kyle MacBeth. For the Dutch (0-8, 0-4), Carter Julian ran for 92 yards on 21 carries. Both of their touchdowns came in the first half when Austin Goodrow scored on a 2-yard run and Tim Beimel returned a kick 87 yards. Brookville closes out the regular season with a trip to Keystone Friday, while St. Marys hosts Clarion. 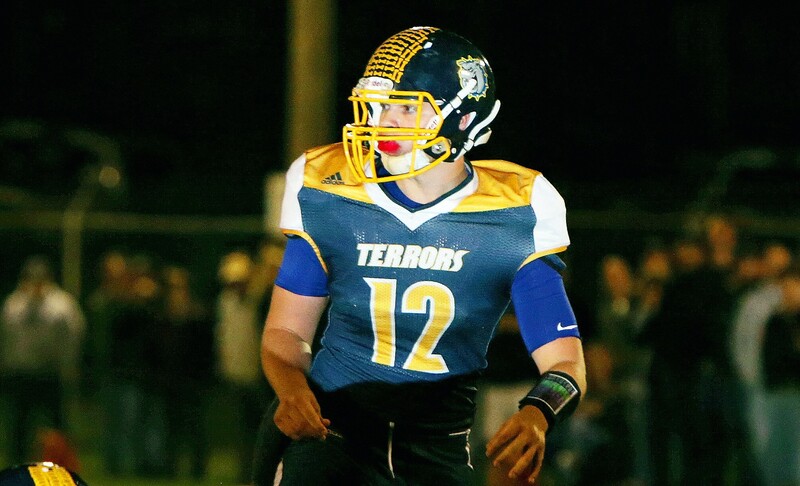 KARNS CITY, Pa. – Karns City sophomore quarterback Anthony Kamenski ran for a pair of touchdowns and threw for a third to help the Gremlins hold off an upset bid by rival Moniteau, 33-19, at Diehl Stadium in Karns City. Kamenski ran nine times for 24 yards scoring on a pair of two-yard runs and was 7 of 9 passing for 155 yards including a 61-yard scoring pass to Brandon Heidence in the third quarter that put Karns City (6-3 overall, 3-2 KSAC Large) up 20-7 at the end of the quarter. His second 2-yard scoring run of the game with 6:08 left made it 27-7. Clay Garing (9 rushes, 45 yards) and Dalton Beham (15 rushes, 68 yards) also scored on the ground for the Gremlins, while Hesidence had three catches for 129 yards. Chance Nagy tossed three touchdowns passes for Moniteau (2-6, 1-4) going 17 of 27 passing for 216 yards and also throwing two interceptions while rushing 11 times for 33 yards. Wyatt Geibel (6 catches, 58 yards), Hunter Fitzingo (1 catch, 16 yards) and Jared Lominski (4 catches, 93 yards) caught the scores for the Warriors, while Manny McLean added 72 yards on the ground. Karns City hosts Clearfield Friday with Moniteau hosting Redbank Valley, also Friday. CLARION, Pa. – Senior Spencer Miller didn’t disappoint in his final home rushing for four touchdowns in a 47-0 Bobcat win over visiting Union/A-C Valley. Miller carried the ball just seven times for 76 yards and scored on runs of 5, 14, 7 and 21 yards helping Clarion (8-0) outgain Union/A-C Valley (1-8) 406 yards to 98 including 308 to 41 on the ground. Miller was also 9 of 12 passing for 108 yards and added an interception on defense. Keeven Weaver (2 carries, 34 yards) also scored on a 24-yard run, while Logan Minich recovered an offensive fumble and rumbled five yards with it for a score rushing for 92 yards on the night on 18 carries. Hunter Craddock added a late score as well. Jeff Ginn paced Union on the ground with 35 yards on nine carries, while Lucas Bowser was 5 of 15 passing for 57 yards with Jonathan Powell catching two passes for 34 yards. Clarion is at St. Marys Friday while Union/A-C Valley travels to Ridgway. RIDGWAY, Pa. – Neil MacDonald ran for a pair of touchdowns to help Ridgway roll past visiting Elk County Catholic, 41-0. MacDonald ran 17 times for 84 yards and was one of five Elkers to score on the ground. Aaron Hinton led Ridgway with 112 yards on six carries with a touchdown with Evan Furlong (7 carries, 53 yards), Jake Zimmerman (9 carries, 50 yards) and Jake Wickett (3 carries, 25 yards) also scoring on the ground. Tyler Dilley led ECC with 76 yards rushing on 12 carries. 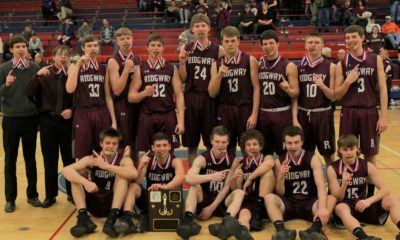 Ridgway is 6-3 overall and 2-3 in the AML South and hosts Union/A-C Valley Friday in Ridgway, while ECC finishes the year 2-7, 0-5. PHILIPSBURG, Pa. – Isaac Rumery threw for 214 yards and four touchdowns to lead Clearfield to a 49-7 win at Philipsburg-Osceola. Rummery threw a pair of scoring passes to Micah Heichel (30 yards, 18 yards) and one each to Jake Lezzer (63 yards) and Taye Lynch (72 yards). The Bison (5-4) also scored on a 14-yard Brett Zattoni run, a 30-yard Zach Horton fumble return and a 6-yard Caleb Freeland run. Clearfield finishes the regular season at Karns City Friday. COUDERSPORT, Pa. – Stephen Kelly ran 14 times for 152 yards and a touchdown to help Coudersport secure a District 9 Class 1A playoff berth with a 46-8 win over visiting Port Allegany. Hayden Keck added a pair of touchdowns for the Falcons (5-4 overall, 4-1 AML North), including on a 36-yard interception return, while rushing for 52 yards and a touchdown on seven carries. Jared Green (8 carries, 92 yards) and Thomas Wilson (7 carries, 63 yards) also scored on the ground for Coudersport while Dustin Kudrick kicked a 22-yard field goal, believed to be the first field goal kicked by Coudersport in at least five years. Offensive lineman Jake Kallenborn threw a 31-yard touchdown pass to Jared Mahon for the lone Port Allegany (2-7, 2-3) touchdown. Devon Smoker ran for 74 yards to lead the Gators offense. Coudersport is off next week before beginning D9 playoff action in two weeks, while Port Allegany’s season is over. DUBOIS, Pa. – Nikolas Grabiec ran for 90 yards and three touchdowns and Ethan Rode added 192 yards and two touchdowns to lead visiting Newport to a 49-14 win over DuBois. The Beavers (3-6) were outgained 430 to 178 on the night with the vistors racking up 325 yards on the ground. Matt Miller was 9 of 19 passing for 110 yards, two touchdowns and an interception for DuBois. Dylan McCluskey caught both scores and finished the night with four catches for 79 yards. Dalton Kruzelak ran for 81 yards.